When my son was young I loved finding DK books on things that interested him. The photography always made the subjects come alive. 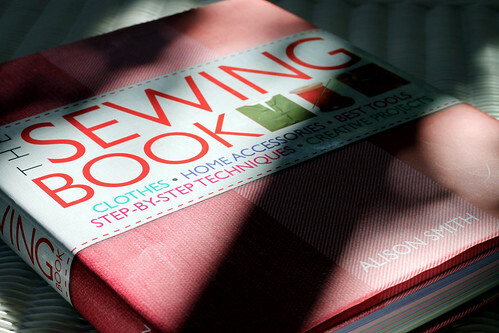 “The Sewing Book” by Alison Smith lives up to the other DK books on our library shelves. The photography is fabulous. At 400 pages it is full of useful information for the beginner to intermediate seamstress. There is a very well done and extensive section on pattern alteration. The projects at the back of the book are simple, but I am going to make up a couple of them for myself. I have been wanting to test sew the decorative stitches on my machine and one project shows a way of incorporating them into a pin cushion, needle case, and scissor holder. This book is a great addition to my other sewing books. It will help me show ‘how to do it’ without having to sew a sample. I love my older books, but they are all illustrated with drawings. Seeing the little puckers and other things will be reassuring to a new seamstress that she is doing it right. I can add my expertise on how to eliminate those little imperfections for a professional result. Otherwise, why would I be paid if it is all in a book? This entry was posted on Wednesday, July 22nd, 2009 at 3:00 am and is filed under Sewing. Tagged: Sewing. You can feed this entry. You can leave a response, or trackback from your own site. I’m glad to have found a sewing expert’s blog. I’m a very competent sewer myself, but hate the large bust adjustments, particularly in strapless princess line patterns. I just finished adjusting a petite girl’s pattern–her full bust measures 8″ more than her over-bust measurement. It seemed to work well on the first trial–but that was on some interfaced lining. On the other hand my daughter’s same outfit fit with no adjustments except a bit of widening in the hip. You are correct! You can add something to it. Many students *need* the teacher to help them get comfortable. And then…the sky is the limit!